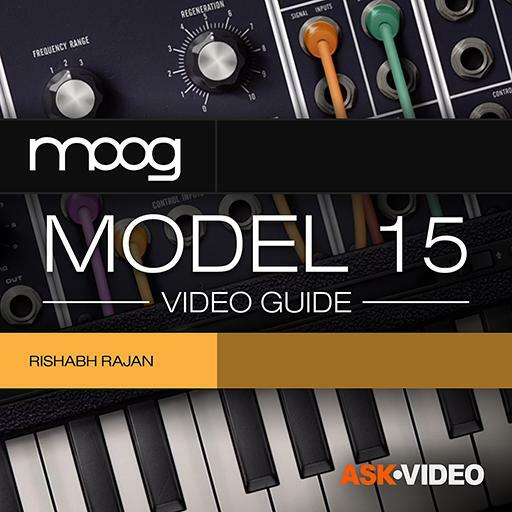 Moog Model 15 101 - Moog Model 15 Video Guide. How many control input(s) does the Delay Module have? The Mod wheel will always have to be assigned to a parameter, there is no default connection for it. True or false? What is the maximum number of steps available on the Arpeggiator? Is it possible to record more than one layer in the Recorder? How many control input(s) does the 904A Low Pass filter have? The Attenuator module can be used to add depth control for any modulation. True or false? How many CCs are available in the MIDI bridge? Which module will let you bring in external audio into the Model 15? A negative version of the signal will be the same signal but phase inverted. True or false? How many copies of a signal can you create with the Multiples? How many signal inputs does the VCA have? By default the 921 oscillator is not key tracked. True or false? Is it possible to create banks to store presets in the Model 15 app? What is the name of the Hardware Modular this app is modeled after? A Low Pass & a High Pass filter can be combined in series to create a Band Pass filter. True or false? Can the 907A Fixed Filter bank be modulated with a Control Signal? Double Tapping on a dial will reset that control to its default value. True or false? Connecting only one of the Trunk Lines will result in signal on one side of the speaker/headphones. True or false? T1, T2 & T3 represent what parameters on the envelope? To get the classic Hard Sync sound, the Master oscillator should be tuned lower than the slave. True or false?